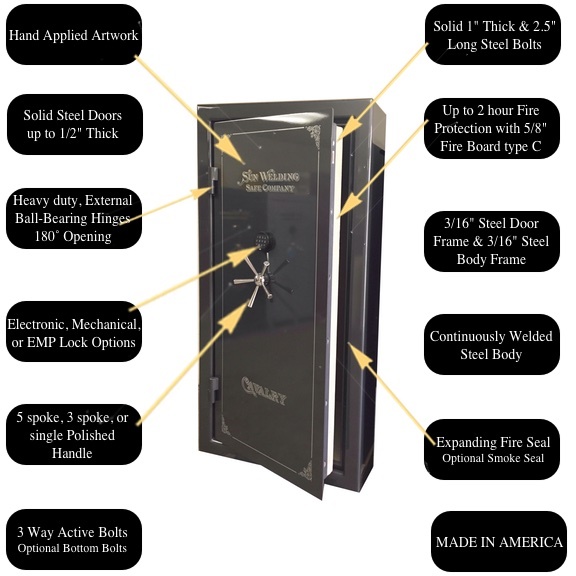 Sun Welding is one of the true constant American Made gun and fire safe manufactured in the USA. Family owned and operated for over 40 years in Ventura County, CA. Every safe built by Sun Welding is 100% hand built and assembled with American parts as much as possible. Sun Welding began before 1980 while the owner was working as a welder. 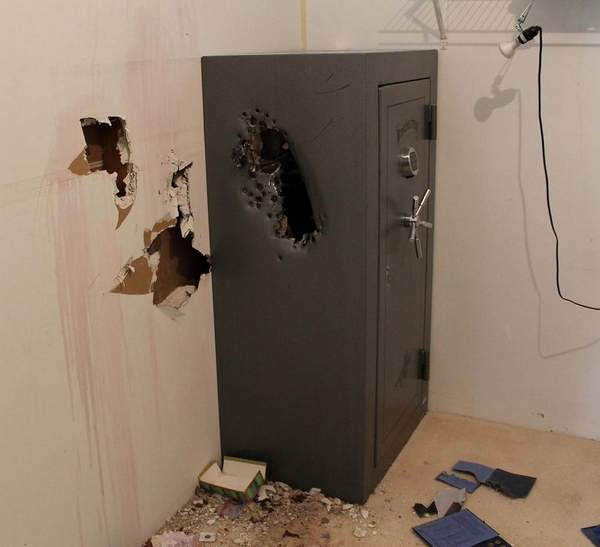 His home was burglarized and decided he wanted to build a safe for security and storage. After the first safe was built many of his family and friends wanted safes and the rest was history. The first safe built is shown on display in the showroom, come check it out! Sun Welding is known for it's American built craftsmanship and factory direct discounts. We feel you should have the quality of a high end safe without paying high name brand pricing. Sun Welding sell's direct to the public and also have relationships with businesses across the US. Sun Welding believes that quality safes should last for generations and that is why we stand behind our product. Sun Welding safes are made from solid steel door (no drywall composite doors) and continuous (not skip welded) steel welded bodies. As you may be able to find a cheaper safe elsewhere you will not get the American built craftsmanship that goes behind each Sun Welding safe. Every Sun Welding safe comes with a lifetime warranty. After you are done searching online, contact Sun Welding for both a safe of good quality and good price. We offer expert advise on finding your perfect safe. Our friendly staff will be able to help you choose the safe that is right for you. About the Door: Sun Welding uses American parts as much as possible. The door starts with a standard solid steel plate door ranging from 1/2" to 3/16" (thicker steel upon request), that is 43% thicker than most competitors 12 gauge (.106") composite drywall door. 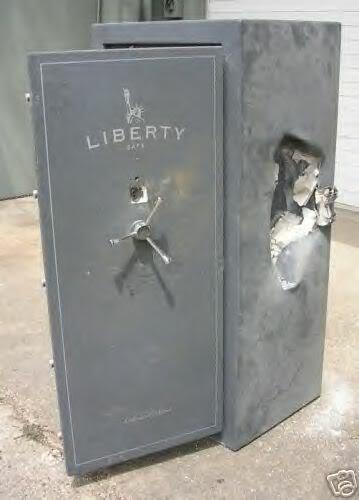 Many manufactures use 12 gauge or the same thickness as the body for the frame on the safe, making their door flexible and vulnerable to pry attacks. Next, backed by Sun Welding's cam drive mechanism moving from one to three active driven bars, a locking shear made from solid 1/2" square steel, and 1" diamerter locking bolts. These are supported by a solid 3/16" thick structural steel frame makes Sun Welding's door more rigid to resist against pry attacks. 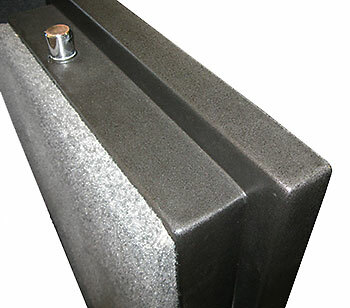 The lock support block and R60 hard plate, totals 3/4" thick to resist from drill and hammer attacks. With two re-lockers one remote and one internal within the lock, adding extra layers of security. Sun Welding's doors are 3" thick and are all removable. Exterior hinges allow the door to open over 180 degrees and are removable to assist with moving. The linkage in the door is supported by one of the strongest frames in the industry, a 3/16" frame on every model. Every bolt pin on a Sun Welding safe is individually mounted and connected to a linkage system for smooth operation. Many manufactures bolt pins are connected to a linkage rod that operates all as one part. Pressure applied to one pin will directly effect the remaining pins on that rod. Sun Welding's doors are over built in all critical attack points making them one of the strongest in the industry! About the Door Frame: Sun Welding is one of the few safe manufactures that makes the door and body frame thicker than the basic industry standard. Sun Welding does not form / bend the door or body frame from the same thickness that the door or body is made from. Why don't we do this? 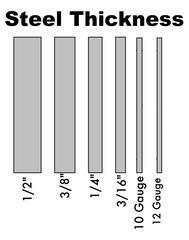 Well if you were buying a entry level safe, say our Renegade Series, the door is 3/16" and the body is 12 gauge. Most companies offer form bent composite drywall style doors where the door frame is formed / bent into shape using thin 12 gauge material and this becomes is your door frame. The bolts in the door are supported by this thin material. That is your security. On Sun Welding Safes the door frame is made from solid 3/16" structural steel angle. Now the locking bolts are supported, or reinforced in a manner so they resist a pry attack. Sun Welding doors do not use cheap plastic bolt guides either. 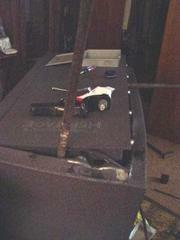 Since the doors on all Sun Welding safes are recessed the body frame helps protect the bolts from an attack. The bolts on all Sun Welding safes extend behind the body frame and are protected. Reinforced bolt works and thick steel are the key to preventing a successful attack on a door. Below: Competitors safe pried open. About the Hinges: Sun Welding uses a heavy duty external hinges allowing the safe door to be removable. External hinges allow the safe door to open a full 180 degrees. Exposed hinges do not compromise security. The only advantage to internal hinges is the cosmetic look of it. A disadvantage to internal hinges are the large pockets of missing fire liner that are required for the hinge to rotate inward and the ability to open the door just over 90 degrees. Below: A Sun Welding Hinge from an attack. Below: A competitor internal hinge. Showing the pocket of fire liner removed for the hinge to rotate into the safe. About the Bolts: Sun Welding safe are all 2.5" long with a 70,000 pound yield point, longer than a majority of the safes in the market. Each pins extends 1/2" behind the body frame. Do not be deceived by thicker bolts. Sun Welding uses a 1" diameter bolt. Some manufactures have increased the size of the bolt to 1.25" or 1.5" thick to give the appearance of more security. Even under tremendous amounts of force our 1" bolts will not move from an attack. Don't be fooled by multiple locking bolts. The true test of a locking system is how it is protected. 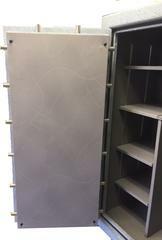 About the Re-lockers: Sun Welding safe has two re-lockers located inside the safe. The safe re-locker is protected behind one 1/2" steel pate and one 1/2" hard plate. 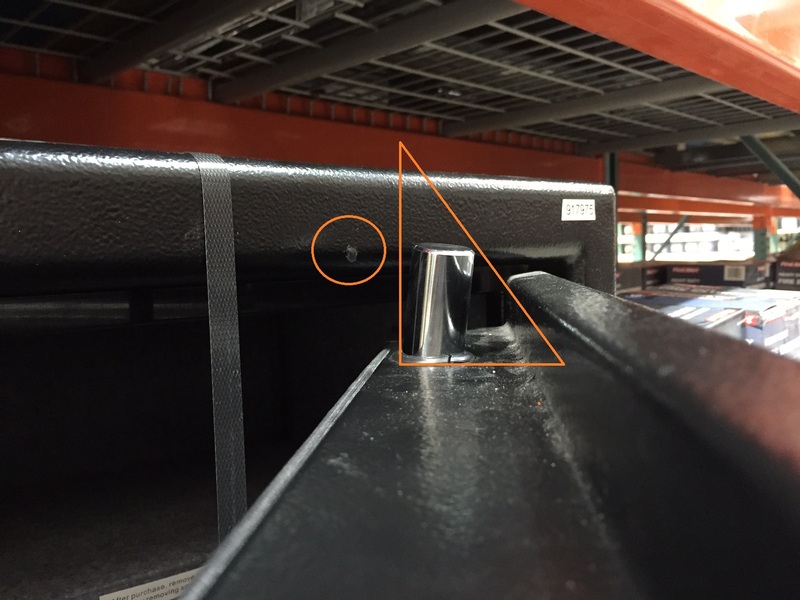 The proper mounted hard plate helps protect the safe against drilling, punching, or manipulation to the lock. The other re-locker can be found inside the lock box. With four difference manufacture's to choose from there is a lock to fit your needs. All locks used by Sun Welding are group II UL listed locks. About the Steel: Sun Welding offers standard from 12 gauge to 1/4" steel bodies. When comparing our 3/16" safe body to a 12 gauge safe body, this safe has 77% more steel. In addition, the door frame (inside the door) is made with all 3/16" steel. The grade steel used is A36 and it is made in America. Sun Welding understands that not everyone can afford or has a need for 1/4" steel bodies and that is why we build from 12 gauge, entry level, up to the most secure solid 1/4" body. We also are well known for custom thicknesses up to 2" thick. Pictured Below: Competitor entry level safe. About the Build: Sun Welding uses MIG welding which is a hot weld for complete penetration. You will not find any skip welds in the bodies of a Sun Welding Safe. Sun Welding Safes uni-body build is a single piece of steel. Sun Welding Safes' doors will not allow a crow bar because of how deep they are recessed. Come check out our showroom where we can show you a competitors safe with skip welds on the backside of the safe where you can see the heat marks from a fire directly attacking those gaps. 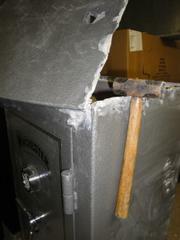 About the Fire Rating: The fire rating on a Sun Welding safe is independently tested and rated. The problem with a safe fire rating is that none of the manufactures have tested the safes at the same facility, under the same specifications. 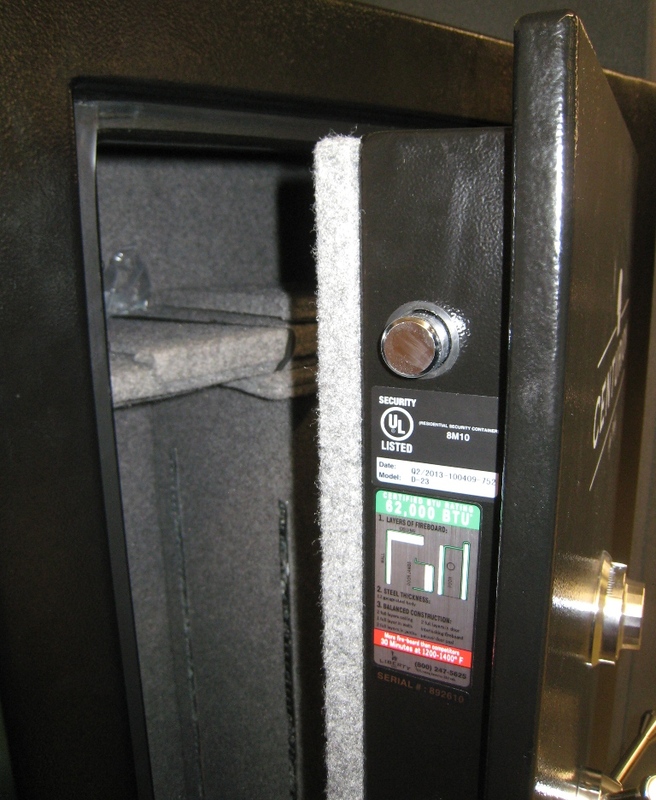 There are many variations of fire testing and ratings for gun safes. Sun Welding would like to be UL Fire rated since they are the only honest testing facility, but they want too much money to test each safe. We offer many different sizes and options that would need to be tested at very high prices for each. We have tested our safes in an oven that was 1200 degrees and at 'x' minutes (basic is 30 minutes up to 120 minutes) the internal temperature of the safe reached 350 degrees. Sun Welding also adds a fire proof safe gasket. The gasket is designed to prevent the spread of fire, smoke, and moisture by expanding seven times it's size. The fire gasket fits against the door perfectly every time. 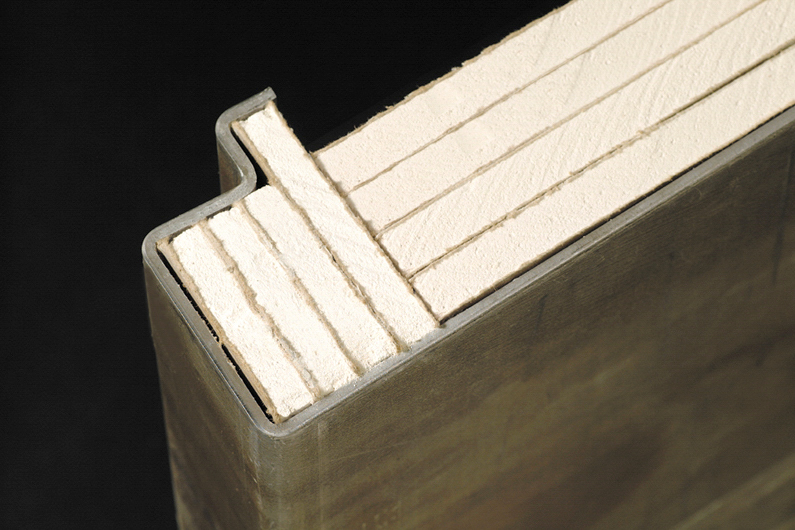 Sun Welding uses a 5/8" thick gypsum fire board to internally line the walls of the safes for fire rating, many competitors only use a 1/2" thick piece of material. About the Finish: Every Sun Welding safe is hand painted and logos are hand applied. The interior is built to the order specifications and installed. Every Sun Welding Safe comes with a lifetime warranty against workmanship. We even offer extended warranties for the locks. 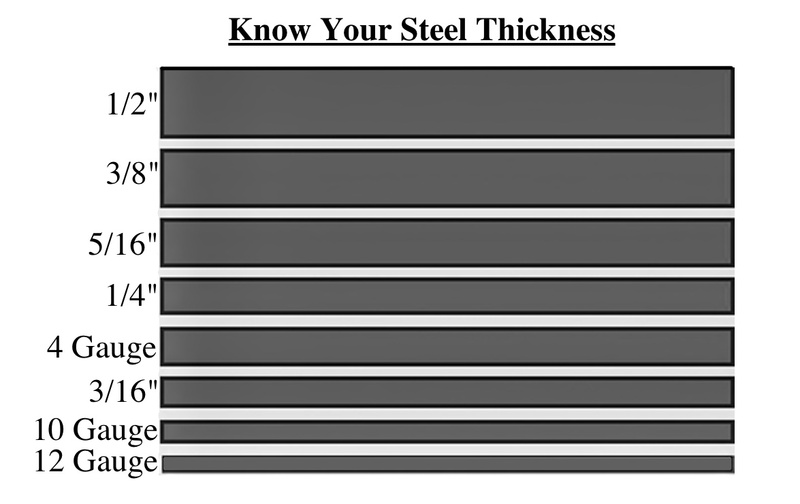 Know your steel thicknesses: Don't be fooled by the 2" thick doors that are filled with drywall, called "composite" style doors. Appearing to be about 6 inches thick, but only formed out of 12 gauge steel and bend when shaking the door. Pictured below: A couple competitors "composite" style doors. Pictured below: A Sun Welding SOLID 3/8" steel door. Where it's made: Is the product your looking at American made? An easy way to tell is based off of the size. Any safe built 59.5"H is an imported safe. Their warranty: Only cover the linkage parts for a year with their warranty. Their thick bolts: Some bolts look larger, but upon closer inspection there is not much of a deadbolt. There is no support for the bolt as it engages when you shut it. Their welds: Some safes on the market have inadequate welding along the safe body called skip welding. In an attack or fire these areas are the first to fail. Their Internal Hinge: Beware of manufacturers that will have you believe hidden hinges are just as good as exposed hinges. Internal hinges allow for only 90 degree door opening and there is a pocket cut into the fire rating where the hinge must go. Exposed hinges are stronger and allow for easier removal and hanging of the door. CA DOJ Approved: All Sun Welding Safes exceed the CA DOJ requirements.